Kenan Thompson is on the verge of becoming the longest-running cast member ever on "Saturday Night Live," but the comedian and actor wants to go back to his first audience: kids. Thompson made his name on Nickelodeon's "All That," and now he's working on a sketch comedy show for kids like the one that got him famous. It's fitting, then, that Thompson is also doing his part to help put an end to child hunger by promoting the Dine Out for No Kid Hungry program. 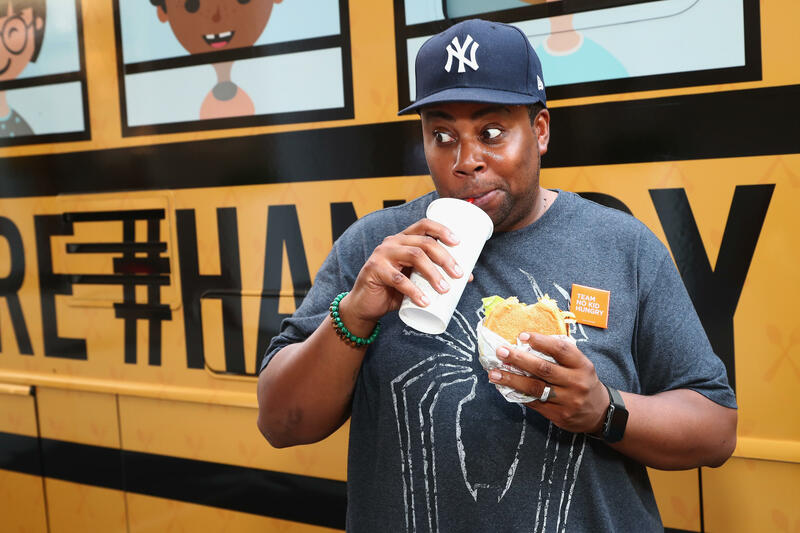 Thompson helped kick off the No Kid Hungry Bus Tour in New York on Tuesday. Thompson talked to CBS News about his work with No Kid Hungry, his kids' comedy project and how he ended up impersonating Neil DeGrasse Tyson in a Tennessee town during the eclipse. Tell me about what you're doing for the No Kid Hungry Dine Out program. I'm teaming up with them to raise awareness. What they're doing is awesome. They've partnered with hundreds of restaurants across the country to help people donate to the cause. They're asking people to post a video or dine at one of these restaurants and if they dine, they're ask to use hashtag #hangry and redefine the term. There are 13 million kids who don't know where their next meal is coming from, but it's a solvable problem so we're asking everybody to get involved. You're producing a kids' sketch comedy show called "Skoogle." What can you tell us about the show? We pitched it around so we're trying to have someone make a deal for it. It's still in the air, but it looks like it's going to land pretty strong so we'll find out what's going on with that in the next couple weeks. It's going to be similar to "All That": a bunch of sketches and musical guests. I'm working with my buddy Josh Server, who used to be on "All That," and my writing partner Mason Garden. He invented SlamBall and he is a producer as well. How does it feel to have a mini "All That" reunion with Josh? It feels awesome. We've been writing together for a long time but we're getting close to a show, so it feels amazing. You were doing sketch on "All That" and now you do it on "Saturday Night Live." Do you think it was always your calling? Yeah, I mean entertainment in some form, at least. I really enjoyed my formal training in high school when we were doing drama and it wasn't necessarily comedy -- just as much as doing comedy. I enjoy entertaining and laughing -- it's really my thing. You're tied with Darrell Hammond as the longest-running "Saturday Night Live" cast member. Are you going to make sure you break that tie? I guess I'm indirectly making sure of it. Supposedly I'll break it once we start the season, so I don't have any control over it. It's insane to think about. But Darrell will always be the king, doing voiceovers. It'll always be his show. I love Darrell. When you were on "All That," were you already dreaming of being on "Saturday Night Live?" Yeah, we used to say that, but no one thought it would happen. It's just amazing to get the chance to audition, because I tried and tried to move on it but they said I looked to young. But finally I got to try out, and I never walked away from the job. You just played Neil DeGrasse Tyson to talk about the eclipse this week. Did you get to see it? Yeah it's so funny. I actually went to Georgia because I'm from Atlanta, so my family was down there. I took my daughter to grandma's house so she could hang out there and my brother and I drove to Cleveland, Tennessee, and we watched the eclipse there. It was so cool. We were watching it with the townsfolk of Cleveland because we were at the courthouse, where everyone was watching. The locals recognized me, so of course I had to throw down some DeGrasse Tyson. They were loving it. Who's left? I already did LaVar Ball. I don't know if there's anyone out there I haven't tried and failed at, or tried, just in general. But if someone pops up, we'll do it. You've said before that "Weekend Update" is your favorite part of doing "SNL." Why is that? It's just the most direct, straight-to-camera form of freedom we have. It's our version of doing stand-up, so you can be as crazy and loose as you want. It's way more fun than when we do sketches. Sketches are mostly about the story. You have to make sure A leads to B to C and blah blah and it becomes way more technical. They can be more hit or miss, but "Weekend Update" -- I'm sitting in the living room with you, entertaining you.